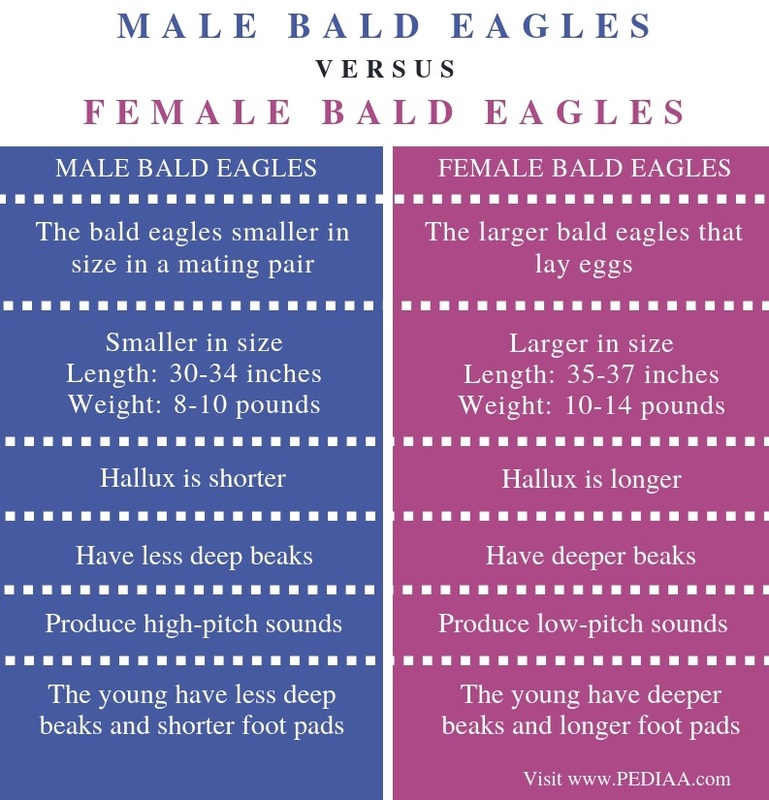 The main difference between male and female bald eagles is that male bald eagles are comparatively small whereas female bald eagles are larger; roughly three times in size. Furthermore, the back-facing talon is short in male bald eagles while it tends to be larger in female bald eagles. Moreover, male bald eagles have comparatively less deep beaks while female bald eagles have deeper beaks. Male and female bald eagles are the differentiated genders of the bald eagle (Haliaeetus leucocephalus), a strong bird of prey that lives in North America. It is majestic in its appearance and is the emblem bird of the United States. Male bald eagles are generally the small eagles in the mating pair. They tend to be 30-34 inches long. Also, they weigh around 8-10 pounds. Usually, all bald eagles have four talons. Three of those talons are in the front while the remaining is at the back. The back-facing talon is known as the hallux, which is generally shorter in male blade eagles. One of the other significant features of male bald eagles is the depth of their beak. Generally, the depth of the beak refers to the width from the top of the beak to the chin of the eagle. Male bald eagles have less deep beaks. However, the bald eagle is the national bird as well as the national animal of the United States of America, appearing on its seal. Female blade eagles are the comparatively large bald eagles in a mating pair. They tend to be 35-37 inches in length. In general, female bald eagles are three times larger than their male counterpart. Also, they weigh 10-14 pounds. Significantly, the hallux of the female bald eagles is longer. Moreover, the depth of the beak of female bald eagles is deeper than that of male bald eagles. The pitch of the sounds of the bald eagle is another characteristic feature, which can be used to identify the gender as female bald eagles produce low pitch sounds when compared to male bald eagles. Also, the discrimination between the young male and female bald eagles is difficult and can be performed after 20 days of birth. Two of the accurate measurements here are the depth of the beak and the length of the foot pads. The young female bald eagles have wider foot pads. Male and female bald eagles are the two gender variations of the bald eagle, a majestic bird that inhabits North America. It is the national emblem of the United States. They live near lakes, rivers, marshes, coasts, etc. Generally, they have large bodies around 30 inches in length, 8-12 pounds in weight with 6-7 feet wingspan. Also, they have a white-feathered head, which gleams when compared to their chocolate brown color wings and the body, earning them the name ‘bald’ eagles. Furthermore, their beaks and feet are bright orange in color while their iris is yellow in color. Besides, they are hunters, soaring in solitude to chase other birds for their food. Their average migratory soaring speed is 50 km per hour. Moreover, they gather in hundreds in winter. They are endangered by hunting and pesticides. Male bald eagles refer to the bald eagles smaller in size in a mating pair while female bald eagles refer to the larger bald eagles that lay eggs. Thus, their size is the main difference between male and female bald eagles. Male bald eagles are smaller in size while female bald eagles are comparatively larger in size. Also, the hallux is shorter in male bald eagles, but it is longer in female bald eagles. 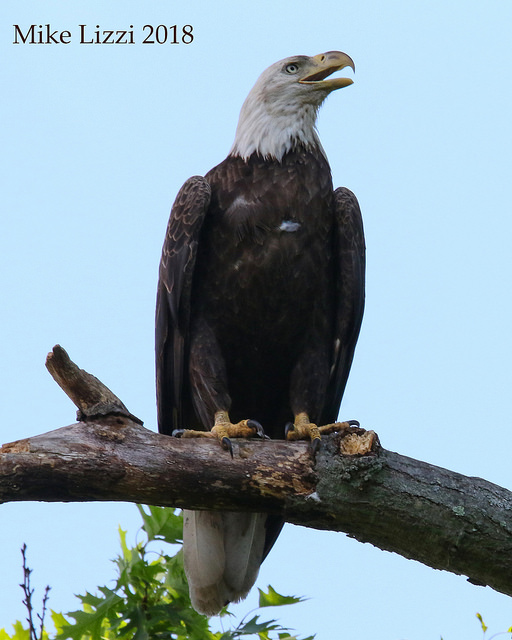 Moreover, the depth of the beak is another difference between male and female bald eagles. The depth of the beak of male bald eagles is less while the depth of the female bald eagles is high. Furthermore, the pitch of the sound produced by male bald eagles is high while the pitch of the sounds produced by female bald eagles is low. Young male bald eagles have less deep beaks and shorter foot pads while young female bald eagles have deeper beaks and longer foot pads. Hence, this is another difference between male and female bald eagles. Male bald eagles are the smaller partners within mating couples. In comparison, female bald eagles are larger in terms of both length and weight. The depth of the beak, hallux talon, and the pitch of the sounds produced by each bald eagles are the other characteristic features involved in gender discrimination. 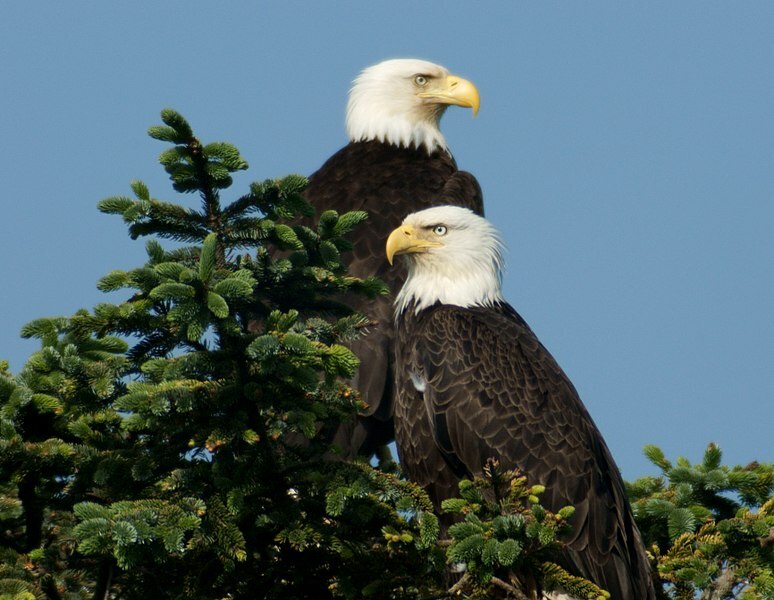 However, the main difference between male and female bald eagles is the size. Generally, bald eagles are majestic birds and fast hunters. 1. “Characteristics of Bald Eagles.” National Parks Service, U.S. Department of the Interior, Available Here.